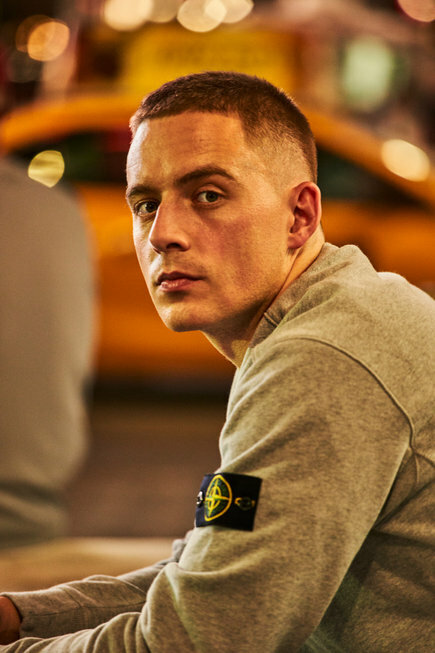 2018 war Dermot Kennedy in ausverkauften Hallen unterwegs und hat mit seinen intensiven Songs, dieser kühnen und goldenen Stimme und seiner fantastischen Band - der Schlagzeuger alleine war das Eintrittsgeld wert! - "insgesamt Quadratkilometer große Gänsehautteppiche auf den Unterarmen der anwesenden Fans gewoben". Jetzt hat er noch einen neuen Track veröffentlicht: Vor ein paar Tagen erschien mit "Power Over Me" ein neues wunderbares Liebeslied über einen Menschen, der einen völlig unter Kontrolle und verhext hat, im besten Sinne, der einen entwaffnet, wenn man ihm nur gegenübertritt. Mit diesem Stück stellt der Ire erneut sein seelenvolles Songwriting-Talent unter Beweis, mit dem er von Beginn an seine Fans bezaubert hat und hoffentlich ist es auch ein Hinweis auf sein künftiges Album. There's a sign on the house Dermot Kennedy has called home for 25 years. "Cois Coille," it reads: Irish for "beside the forest," a nod to the vast mountains and huge sprawl of trees not far from his front door. "Whenever I've been away, eventually I need to come back and reset," admits the fast-rising star, who grew up here in Rathcoole, a village nestled between the wilderness of County Kildare and the frantic bustle of Dublin. It's a contrast that also exists at the heart of his music: rustic, tender singer-songwriter laments full of scenic beauty, set to urban, electronic beats. "I really like that clash," he explains of his acclaimed mix of intimate, guitar-led storytelling and hip-hop-inspired production. "Making those two worlds collide is really exciting to me." He's not the only one who's excited. Since the release of his stunning April 2017 EP, Doves and Ravens, and follow-up single 'Moments Passed', Kennedy has shot to over 300m plays on streaming platforms, been hailed as a "big, beautiful and bold" new voice by Beats 1's Zane Lowe, won praise from everyone from TIME Magazine to Wonderland. He's also supported Lana Del Rey and worked his way on the radar of rap super producer Mike Dean, best known for his work with Kanye West and Travis Scott, with whom he made his stunning 5 track mixtape. And the music keeps coming with the darkly anthemic "Power Over Me" due for release. The 25-year-old describes his songs as struggles between two extremes: light and dark, love and loss, life and death, happiness and sorrow. "All my tracks sort of toggle between two themes, even within the same song: it can go back and forth from line to line," he says. The deeply personal 'Moments Passed', for example, was dragged from the rubble of a time of simultaneous pain and blossoming romance for the young Irishman, who was both mourning the death of a friend and falling in love when he wrote it. "Sometimes it's hard to pin a song down. More often it's a battle between two opposites like that." Kennedy got his first guitar aged 11, and "got serious" aged six years later, before a chance encounter with another of his musical heroes gave him his first big break. Beloved Irish songwriter Glen Hansard had been walking through Dublin when Kennedy spotted him one day in the street, around the time of his first recordings. "I invited him to the studio," Kennedy recalls. "He couldn't make it, but he called back and offered me ten minutes onstage at his sold-out Christmas show." The youngster performed his 2016 single 'After Rain' and the response was immediate: the track went on to rack up a staggering 47m million streams on Spotify. 'Moments Passed', now with a spectacular video directed by Frank Ocean and Kendrick Lamar collaborator Nabil has continued his success. Dermot has spent the past year or so touring. From just playing small gigs at home and in Dublin, his fanbase has grown massively with Dermot playing live shows across the UK, Europe and America. "The tours have all been sold out and so there's quite a lot of people all over the world who have connected in some way." he notes -" I remember I used to do gigs in Dublin where I knew every single person that was at it! Now there's loads of people connecting, especially at home it's kinda nice to know I'm connecting to people my own age In Ireland". He has seen his past and present cross over. "I played a festival in Ireland called Electric Picnic. I remember me and my dad drove to it once when I was a kid and parked just outside the artists area just to see what was going on" he reminisces- " I thought how cool it would be to play the festival and hang out there and then I did it all this summer - it was surreal, one hundred percent". With over 100,000 tickets already sold this year and currently on his 42 date headline sold out World Tour, Dermot has already announced new dates for spring 2019 which includes the legendary Brixton Academy. With highly acclaimed performances on the likes of NPR's Tiny Desk series and Colours Berlin to his name, musically the 25-year-old is too focused on pushing his artistic boundaries on his upcoming debut album to pay attention to any hype. "Having spent a lot of time in the acoustic world, it felt really good to do something new and push myself out of my comfort zone on these recent tracks," he says of his increasing electronic experimentation. "I'd be letting myself down if I didn't chase that, if I just did what came easy to me." His travels too have become an unexpected influence on his song writing. "Despite the fact that I grew up around nothing but fields and a forest, to me it seems like New York is the most exciting place to be. I think it would be such a good place to make music in terms of just the energy that's here, just somewhere you can think and write stuff that actually is honest and exciting. Just don't expect him to abandon his roots entirely. "Considering the lineage we've got in Ireland in music and the songwriters we've had, I'm so glad to be part of that. I don't want to go too far. The trick is to be able to strip a song of all its production and for it to still tell a good story that makes you feel something. Certain things run through all sorts of music that appeal to me, whether that's a hip-hop artist or a singer-songwriter: honesty and a good story." Dermot Kennedy's story, you get the feeling, is just beginning.